“As late capitalism writhed in its internal decision concerning whether to destroy Earth’s biosphere or change its rules, many argued for the destruction of the biosphere as being the lesser of two evils.” – Kim Stanley Robinson in his novel, 2312. Donald Trump has been even more in the news than usual recently over his proclamation that Muslims should be barred entry into this country, setting off a firestorm of criticism from the left, of course, but also from all the other candidates for the Republican primary. And yes, i need to admit right up front that i wrote a little post back in September in which i expressed horror over the idea of a wave of Muslim immigrants to this country, fearing that they’d behave just like the Catholics did over a century ago when we let a bunch of ’em in and the first thing they did in areas where they were sufficiently numerous was to outlaw the sale of contraceptives, forcing their religious laws on everyone, not just Catholics. I feared the Muslims would likewise institute elements of sharia law whenever they could. Nor, of course, did i feel too good about admitting into this country refugees whose holy Quran tells them to kill me. However, having Trump propose what i was advocating gave me pause. And then i saw that delightful Dit is Normaal video, which sharpened my focus as i realized that Christian holy scriptures are full of rules at least as awful as anything in the Quran, like stoning to death for those caught working on the Sabbath, adulterers, blasphemers, rebellious sons, witches, and male homosexuals (but not female, which was unimaginable to the men who wrote the scriptures). This made me think about the misogyny and homophobia rampant in the African branches of the Christian churches, worse than even the Roman Catholics in this country. And then it struck me. The problem with Trump’s proposal is that he didn’t go far enough. Rather than just barring entry to Muslims, we also need to bar entry to Christians since the two religions share the passionate desire to make everyone else obey their rules. So let’s just go ahead and bar entry to anyone who practices a religion which he wants to force down everyone else’s throat. And then we’d have a society that truly practiced freedom of religion. 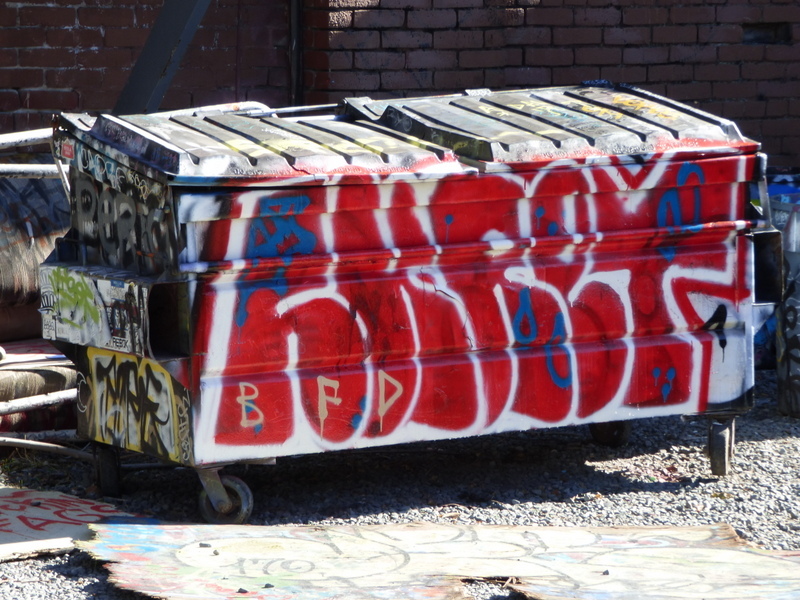 Meanwhile, the winner of the Best Petaluma Dumpster award. You and Donald make the same mistake, confusing the ideology of the Caliphate with the teachings of mainstream Islam. If we cannot grant freedom of thought and belief to others, how dare we appropriate it for ourselves. We are far more in danger from coal and oil than we are from imported jihadists. Certainly i agree that we are in far more danger from coal and oil than from imported jihadists, and i agree with the Pentagon that we are in greater danger from domestic terrorists than from imported ones. And yes, i recognize that the majority of Muslims, like the majority of Christians, don’t go along with the parts of their holy scriptures that call for my death. And still, i fret over letting folks like Catholics and Muslims in since their idea of freedom is to force me to follow their dictates even though only a lunatic fringe call for my death. I direct your attention to a recent Danish poll. In my eagerness to spring to my own defense, i neglected to point out that the post was intended to be a satire in imitation of Swift’s “A Modest Proposal”, a proposal that was the very opposite of modest in its outrageousness. Never let it be said of me, “Thy inoffensive satires never bite.” Fortunately, we now have in this country sufficient opposition to religious bigotry to prevent it from controlling the rest of us. Case in point, the recent firestorm over the Roman Catholic hospital in Redding, CA seeking to prevent an admitting physician from performing tubal ligations during C-sections. So i guess we can go ahead and let a few more Catholics and Muslims in so long as we remain vigilant against them.